Q. Since the world has now ripped away the masquerade, does this mean mankind will finally start hunting the creatures that have treated them as prey for so long en masse, in any official capacity? A. Things like Hellsing were official already — just secret. The main difference now is that their efforts (and budgets) will be up for public scrutiny. Unfortunately for poor Sir Penwood’s successor. Integra: And I want laser-equipped helicopters, and a new fleet of tanks, and a rocket-powered pony. Q. Will ’99 destroy the backing many white-supremacist and neo-Nazi groups worldwide receive? A. It puts a damper on them for a long time, at least. They’re awfully resilient; even public knowledge of the Holocaust hasn’t been enough to wipe them out. They’re like cockroaches that way. Q. 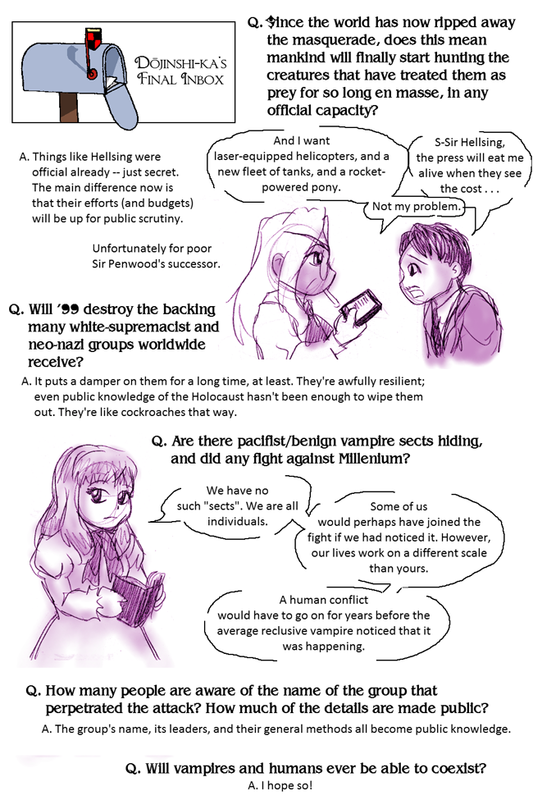 Are there pacifist/benign vampire sects hiding, and did any fight against Millennium? Helena: We have no such “sects.” We are all individuals. Some of us would perhaps have joined the fight if we had noticed it. However, our lives work on a different scale than yours. A human conflict would have to go on for years before the average reclusive vampire noticed that it was happening. Q. How many people are aware of the group that perpetuated the attack? How much of the details are made public? A. The group’s name, its leaders, and their general methods all become public knowledge. Q. Will vampires and humans ever be able to coexist?